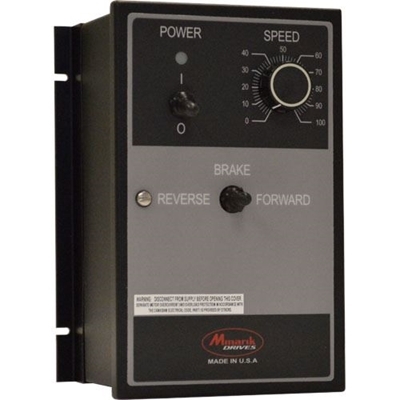 Minarik Drives' RG500A consists of a full-wave, four-quadrant regenerative SCR drive in a NEMA 4X enclosure to provide smooth motoring and braking torque for brush-type DC motors. Mounted operators include power on/off switch, speed potentiometer and reverse/brake/forward switch. This drive is ideal in applications requiring protection from washdown, splashing liquids, corrosive material, windblown dust, incidental contact with enclosed equipment or any external solid objects. Slide switches allow the RG500A to accept a 115 or 230VAC input to run 90 or 180VDC motors. A field supply is also proivded for shunt motors. The switch selectable tachometer feedback mode virtually guarantees constant set speed under varying load. The RG500A is compatible with the PCM4 signal isolator, the DLC digital controller and the 200-0386A limit switch logic board. Applications with overhauling loads, rapid deceleration, basic positioning and high duty cycle reversing and braking benefit from this versatile regenerative drive. NEMA 4X enclosure: Rugged metal enclosure protects against dirt, water and corrosive agents. Speed range and regulation: 1% regulation over 50:1 speed range. 0.1% regulation over 60:1 speed range with the addition of a tachometer for feedback. Armature or tachometer mode is switch selectable. Diagnostic LEDs: Power On light on front of enclosure. Stopping Modes: User can regeneratively brake (run/brake switch), coast to a stop (power on/off switch) or decelerate to stop (N.O.). User can also decerlate to min speed (N.C). Screw terminal block: Easy and secure wire terminations. On board fusing: No need to add external fusing for protection of your drive.